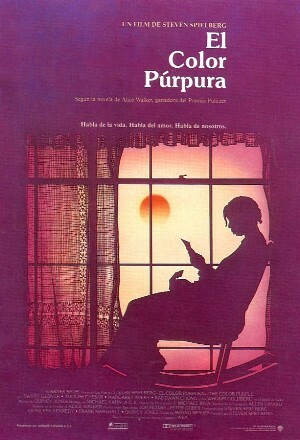 La historia se centra en la vida de Celie, una joven muchacha de color, a principios de siglo. Celie tiene 14 años y esta embarazada de su propio padre, y así continúa su difícil existencia 30 años más. Danny Glover, Whoopi Goldberg, Margaret Avery, Oprah Winfrey, Willard E. Pugh, Akosua Busia, Desreta Jackson, Adolph Caesar, Rae Dawn Chong, Dana Ivey, Leonard Jackson, Bennet Guillory, John Patton Jr., Carl Anderson, Susan Beaubian, James Tillis, Phillip Strong, Laurence Fishburne, Peto Kinsaka, Lelo Masamba, Margaret Freeman, Howard Starr, Daphaine Oliver, Jadili Johnson, Lillian Nioki Distefano, Donna Blue, Leon Rippy, John R. Hart, David Thomas, Carrie Murray, Juliet Poe, Katie Simon, Ethel Taylor, Marcus Covington, Marcus Liles, April Myres, Maurice Moore, Lechanda Latharp, Drew Bundini Brown, Arnold Turner, Jeris Poindexter, James Hawthorne, Saunders Sonny Terry, Greg Phillinganes, Roy Gaines, Paulinho Da Costa, Nana Yaw Asiedu, Clarence Avant, Bayo Martin, Ndugo Chancler, Jeffrey Kwashi, Pete Munzhi, Aniijia Rae Schockley. Allen Daviau (Montaje), Alice Walker, Menno Meyjes (Guión), Jeremy Lubbock, Caiphus Semenya, Jack Hayes, Fred Steiner, Chris Boardman, Jorge Calandrelli, Jerry Hey, Joel Rosenbaum, Andrae Crouch, Quincy Jones, Rod Temperton, Randy Kerber (Música).